It was another close result, but the Wood River High School tennis team trimmed the Community School 8-4 Thursday in the second meeting of the season of the schools. Both Blaine County prep tennis teams are powerhouses in their respective classifications at the state tennis tournament each year. Playing in Hailey, the Cutthroats boys swept singles behind Willis Sanchez-duPont, Trenor Gould and Daniel DuFur. But the Wolverines won just about everything else including two forfeits. At No. 1 mixed doubles, Nick Wright-Hannah Dies of the Community School avenged a close split-set setback earlier in the season and managed to hold off Taylor Cooper-Tate Morell of Wood River 3-6, 6-2, 6-4. Wood River senior Lily Richards, gaining confidence each match, reversed an earlier straight-set loss at No. 1 girls’ singles to Olivia Ott of the Community School. This time Richards prevailed 6-1, 6-3 as the Wolverine girls won their meet 5.5 to 0.5. The Cutthroat boys out-pointed Wood River 3.5 to 2.5 in the other gender result. Also Thursday, Wood River defeated Canyon Ridge of Twin Falls 12-0 in a Great Basin Conference (GBC) clash. It was a final tune-up before this week’s district meet. Coach Carlos Meza’s Wolverines are aiming for the state-qualifying GBC district tourney today, Wednesday and Thursday, May 8-9 in Twin Falls. Meanwhile, the Cutthroats traveled to Madison Junior High School in Rexburg on Saturday and wrapped up their regular-season slate with a 7-5 victory over the Sugar-Salem Diggers. The Sun Valley girls prevailed 4-2, while the boys tied the Diggers 3-3. The Cutthroats forfeited three of the 12 matches, but swept girls’ doubles with Isabelle Caraluzzi-Marleigh Poulsen and Blair Baker-Samantha Bunting. No. 1 boys’ doubles Roger Figge-Henry Everitt won 6-2, 6-1, while No. 2 Colby Wright-Patrick Riedinger fell 7-6 (14-12), 6-4. Singles winners Saturday in straight sets were No. 1 players Trenor Gould and Olivia Ott, and No. 2 players George Everitt and Hannah Conn. In No. 3 singles, Todd Yu dropped 14-12 and 16-14 tiebreakers. The Cutthroats have their own state-qualifying district tournament playing with Gooding and Sugar-Salem Friday, May 10 at 9 a.m. at Sun Valley Tennis Club. From each of the five events, three singles players and three doubles teams qualify for the State 3A tourney May 17-18 in Caldwell. · Boys’ singles: 1—Willis Sanchez-duPont (CS) 6-3, 6-2 over Stephen Pfeiffer (WR) 6-2, 6-1. 2—Trenor Gould (CS) 6-3, 6-2 over Michael Niedrich (WR). 3—Daniel DuFur (CS) 6-0, 6-0 6-3, 6-4 over Jose Juarez (WR). · Girls’ singles: 1—Lily Richards (WR) 6-1, 6-3 over Olivia Ott (CS). 2—Alex Feldman (WR) 6-2, 6-2 over Hannah Conn (CS). 3—Tayte Kelly (WR) won by forfeit. · Boys’ doubles: 1—Cole Caminiti-Josh Morell (WR) 6-1, 6-1 over Henry Everitt-Roger Figge (CS). 2—Erik Wilander-Danny Graves (WR) 6-0, 6-3 over Ethan Kjesbo-Reed Roudabush (CS). · Girls’ doubles: 1—Margaret Reutter-Haley Cutler (WR) 6-0, 6-0 over Erin Hennessy-Jolie Blair (CS). 2—Alex Taylor-Samantha Taylor (WR) won by forfeit. · Mixed doubles: 1—Nick Wright-Hannah Dies (CS) 3-6, 6-2, 6-4 over Taylor Cooper-Tate Morell (WR). 2—Miles Remington-Megan Murphy (WR) 6-2, 6-1 over Patrick Riedinger-Isabelle Caraluzzi (CS). · Boys’ singles: 1—Michael Niedrich (WR) 6-1, 6-3 over Aldo Cordova (CR). 2—Jose Juarez (WR) 6-1, 7-5 over Adam Clark (CR). 3—WR won by forfeit. · Girls’ singles: 1—Lily Richards (WR) 6-2, 6-3 over Jessica Wilson (CR). 2—Alex Feldman (WR) 6-4, 6-3 over Maddie Dahlquist (CR). 3—Tayte Kelly (WR) 6-1, 6-3 over Catherine Harris (CR). · Boys’ doubles: 1—Cole Caminiti-Josh Morell (WR) 6-1, 6-0 over Tristan Greaves-Dallin Romney (CR). 2—Erik Wilander-Danny Graves (WR) 6-0, 6-0 over Conner Reigenbach-Alex Montes Deoca (CR). · Girls’ doubles: 1—Alex Taylor-Samantha Taylor (WR) 6-0, 6-0 over Jaime Leblanc-Abi Drexler (CR). 2—WR won by forfeit. · Mixed doubles: 1—Jose Juarez-Audrey Brassil (WR) 6-0, 6-4 over Austin McGwan-Maylee Woody (CR). 2—WR won by forfeit. With no defending champions returning, there will be new champions in each of the five events Thursday when the two-day Great Basin Conference 4A district tennis tournament wraps up in Twin Falls. Hailey’s Wood River High School won four of the five categories last May and swept both the girls’ team races (62-37 over Twin Falls) and the boys’ team standings (78-41 over Twin Falls). This year, the Wolverines have only one top-seeded entry. That is the girls’ doubles pairing of senior Margaret Reutter and sophomore Haley Cutler, who won the Capital Invitational No. 1 girls’ doubles title April 27 in Boise. Last year Reutter played girls’ singles and Cutler teamed with Quentin Dowdle in mixed doubles for second at district. Otherwise, Wood River will have three second seeds when the six-school, 95-player tournament begins today, Wednesday in Twin Falls. Earning first-round byes for their No. 2 seeds were Wolverine senior Lily Richards in girls’ singles, junior Stephen Pfeiffer in boys’ singles, and seniors Cole Caminiti and Josh Morell in boys’ doubles. Richards placed second in district singles last year, as did Caminiti-Morell in doubles. Wood River has a No. 4 seed in mixed doubles with sophomores Taylor Cooper and Tate Morell also getting a first-round bye. 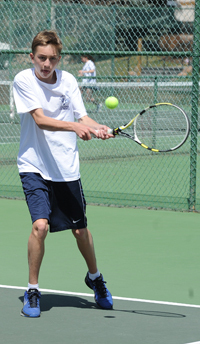 Twin Falls High School has three top seeds—last year’s district runner-up Dallas Hunt in boys’ singles, Brad Pierce and Karin Olsen in mixed doubles, and Andy Carter-Cole Hunt in boys’ doubles. Minico’s Eva Mollik is the top seed in girls’ doubles. First-round matches begin Wednesday at 10 a.m. Players and teams with first-round byes start at 11:30 a.m. Championship matches are scheduled for Thursday at 1 p.m. (doubles) and 2:30 p.m. (singles). The district tournament will be played at five sites—the College of Southern Idaho courts (boys’ doubles), Harmon Park (girls’ doubles), Frontier Field (mixed doubles), Canyon Ridge High School (girls’ singles) and Twin Falls High School (boys’ singles). The top four finishers in each event will represent the district at the State 4A tournament May 17-18 at Boise Racquet and Swim Club. The 4A State meet is a seeded tournament starting in 2013. Eight players or teams will be seeded in each event at the 2013 State 4A tourney—the top four seeds at Boise May 17-18 being the district champions from Districts 1/2, District 3, District 4 and Districts 5/6.